Synopsis: A divorced dad and his ex-con brother resort to a desperate scheme in order to save their family’s farm in West Texas. Between his prison drama Starred Up and his sci-fi romance Perfect Sense, director David Mackenzie has been simmering away in the independent filmmaking underground. With Hell or High Water, he is poised to break through. 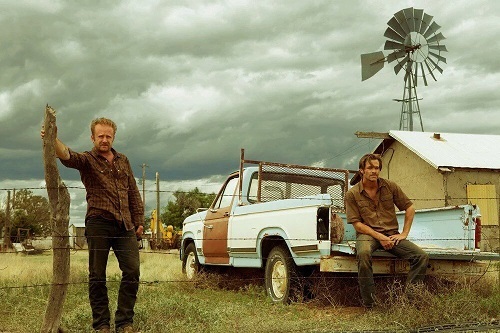 Hell or High Water follows the exploits of Toby and Tanner Howard (Star Trek‘s Chris Pine and Warcraft‘s Ben Foster, respectively), a pair of brothers who systematically rob banks all over West Texas. It also follows a cop named Marcus Hamilton (Jeff Bridges from Crazy Heart) who, days from retirement, convinces his partner, Alberto (Gil Birmingham from the Twilight movies), to help him make the bank robberies the successful last case of his law enforcement career. As the robbers get more daring, the officers get closer to figuring out their plan, until both sides end up on an inevitable collision course. Hell or High Water is a different kind of modern-day western. From a technical standpoint, Mackenzie has crafted a near-perfect film. It’s beautifully shot by Mackenzie’s go-to cinematographer Giles Nuttgens (Dom Hemingway, Battlefield Earth). It features a remarkably haunting score by Nick Cave (Lawless) and Warren Ellis (Mustang). Both Chris Pine and Jeff Bridges turn in “that was him?” performances that push the boundaries of audience expectations. From a story standpoint, Hell or High Water is a slow and steady reveal. On the surface, it’s a pretty straightforward plot. But, little by little, layers are peeled back and motivations are revealed, so the simple storyline winds up very complicated. It’s not complex in a hard-to-understand way – it’s just that it’s ingenious in its methodology. In many ways, Hell or High Water seems like a lost Coen Brothers film, and not just due to the presence of Jeff Bridges. The biggest problem that Hell or High Water will have is finding its audience. It’s a tough film to pin down. Is it a western? A heist film? A crime mystery? It’s all of that, and none of that. Whatever it is, it’s a wonderful film. If its audience finds it, they’ll love it. Best known as Deputy Hale on “Sons of Anarchy,” Taylor Sheridan proved his worth as a screenwriter with last year’s Sicario. Hell or High Water reinforces that proof. The story is cleverly told from the point of view of the cops and the robbers, so the audience always has more information than any of the characters do. This leads to some great moments of show-em-the-bomb suspense, as well as to a shifting sense of right and wrong, an ambiguous feeling as to who are actually the heroes and who are the villains. And Sheridan does all of this without making the audience think that it’s being manipulated. Add in the fact that, possibly from his years of acting, Sheridan has a great ear for dialogue, and the screenplay for Hell or High Water is one of the best of the year.